Loess covers about one-tenth of the world’s land area. While it is often used as embankment fill, loess is not an ideal construction material due to its wet collapsible nature, as it may cause significant embankment settlement and other related problems. Although explosive compaction (EC) technology has been used for many years, the challenges in experimental testing and theoretical analysis hinder its wider application. 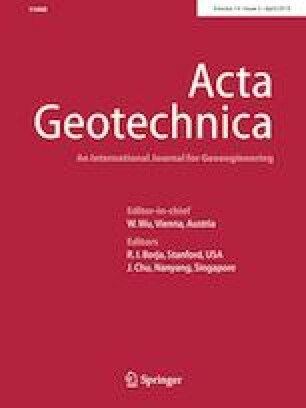 This paper contributes to the development of a design construction scheme of EC technology for loess embankment improvement through an integrated approach that involves finite element modeling, small-scale experiments, full-scale simulation and field implementation. In this study, a reliable finite element model is developed and validated through a small-scale experiment. The model is developed based on the software ANSYS/LS-DYNA®14.5 and takes into account the coupling between different materials (including soil, explosives, air and pavement). Critical performance factors such as the volume of the explosion cavity, the density of the compacted soil and the soil pressure can be obtained directly from the model. The model is then extended to simulate full-scale embankments. A sensitivity study is conducted to establish the correlations between the design parameters and the abovementioned performance factors. The relationships served as design guidelines for the successful implementation of the EC technique in an embankment section on the Cheng-Chao highway in China. The results demonstrated the feasibility of the EC technique as a ground improvement method for loess embankments, and it illustrated the effectiveness of the numerical method as a tool in design. The research team would like to acknowledge the support and assistance from the Chengde Municipal Bureau of Transportation. The writing of the paper is supported by the China Scholarship Council.